The NFL season will start ramping up later this month as training camps start around the league. With that, veterans and rookies come together and start to build what their teams will look like for 2017. One important piece of that building with be the relationships forged between that of the quarterback and his top targets for the season. The Patriots receive the No. 1 ranking here not because they won the Super Bowl last season. They do so because QB Tom Brady fielded the highest graded season by a quarterback in the PFF Era. 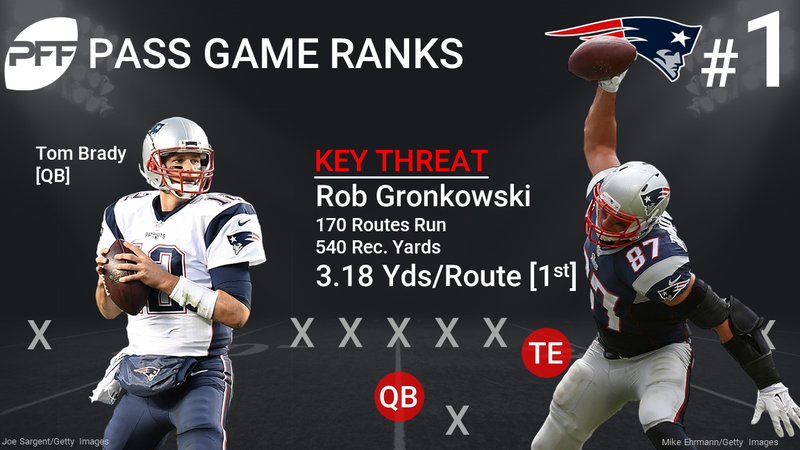 And because TE Rob Gronkowski’s 3.18 yards per route run ranked first not just among tight ends, but among all receivers. Combine all that with Brady’s other receiving threats in Julian Edelman, newly acquired Brandin Cooks and the RB-pass-catching-duo of James White and Dion Lewis – and, well, you get the point. QB Matt Ryan highlights the Falcons at No. 2 – as he finished as the leader in three different PFF-exclusive Signature Stat categories last season. Combine that with our top-graded WR from last season in Julio Jones, and you have one formidable passing game in Atlanta with just the two of them. Atlanta’s passing attack runs much deeper than just that combination though, with capable complementary play from Mohamed Sanu and Taylor Gabriel at WR and out of the backfield with Tevin Coleman and Devonta Freeman. The only question mark heading into the season is how far they will regress with the loss of offensive coordinator, Kyle Shanahan. What can’t Aaron Rodgers do? He extends plays better than just about every other QB, throwing for a league-leading 28 touchdowns on passes in which he threw the ball in 2.6 seconds or longer after the snap. Rodgers, also had the league’s best passer rating when pressured. Combine that with a WR in the backfield in Ty Montgomery, your fifth-ranked WR in terms of passer rating when targeted in Jordy Nelson (122.4) with the likes of Devante Adams (18th highest passer rating when targeted) and Randall Cobb (20th), and the Packers are firmly entrenched at No. 3. The Buccaneers added some serious weapons to QB Jameis Winston’s disposal in the offseason to bolster their ranking at No. 4. Already on the team was PFF’s second highest graded WR last year in Mike Evans, and they added the league-leader in deep pass receiving yards last season – DeSean Jackson, who hauled in 579 yards on deep passes. Factor in rookies O.J. Howard and Chris Godwin (who led the Big 10 in deep pass receiving yards last season) with Adam Humphries and TE Cameron Brate, and the Bucs could have an aerial assault almost unmatched in the NFL. The four B’s in Pittsburgh? 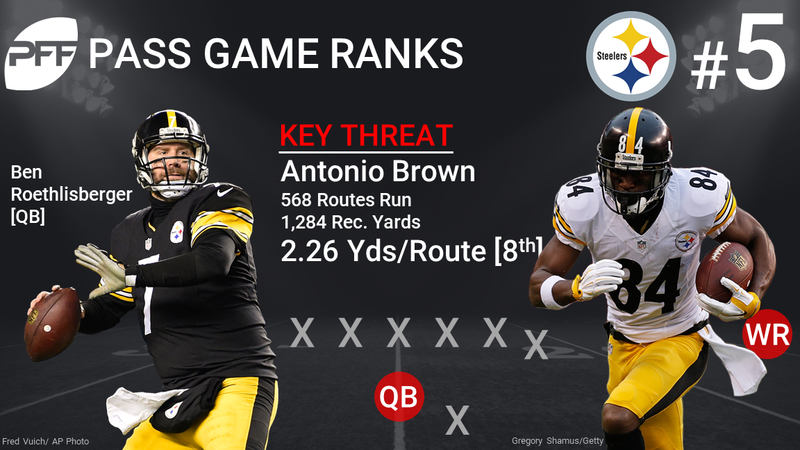 The three B’s (Ben, Bell, Brown) were good last year for the Steelers – QB Ben Roethlisberger (led the league in deep pass TDs with 13), RB Le’Veon Bell (eighth highest yards per route run among RBS) and WR Antonio Brown (2.26 yards per route run ranked eighth among WRs) -but add in the potential return of WR Martavis Bryant, who had the 25th most deep pass yards and the 44th highest passer rating when targeted in 2015, and the Steelers offense could be even better in 2017. RB David Johnson highlights the Cardinals at No. 6, as all he did in 2016 was field the highest receiving grade among all 62 qualifying running backs. His 92.6 grade was second across all positions, to only Julio Jones. QB Carson Palmer threw the third most TDs on quick passes (21), Larry Fitzgerald finished joint-second with 63 receptions from the slot, and the combination of J.J. Nelson and John Brown gives the Cardinals receiving threats that start to stack up. Can Nelson and Brown increase their yards per route run from last season? If so, watch out NFC West. Gone are the likes of DeSean Jackson (the league-leader in deep pass receiving yards) and Pierre Garcon (the eighth highest graded WR), but back are Kirk Cousins, Jamison Crowder and Jordan Reed. Cousins led the league with 1,359 yards on passes targeted 20 yards or more downfield and had the fourth highest passer rating on those passes last season (118.1). Crowder finished with the 16th highest passer rating when targeted overall (112.9) and tied for second with seven touchdowns from the slot while Reed fielded the lowest drop rate among tight ends (dropped just 1-of-67 catchable passes). Add in newly acquired Terrelle Pryor and Brian Quick, a cast of reliable receiving characters and the possible emergence of Josh Doctson, and there is no reason to believe the Redskins won’t air it out again in 2017. QB Dak Prescott was great during his rookie campaign, and sensational on play action. He fielded the highest passer rating (124.4) and highest completion percentage (76.1) on play action passes all the while WR Cole Beasley saw the fourth highest passer rating when targeted ( 122.8) among wide receivers with at least 44 targets. Oh, and there’s Dez Bryant catching passes from Prescott, who all he did was finish as our 11th highest graded receiver and field the 23rd highest passer rating when targeted. Oakland Raiders QB Derek Carr became the richest QB in NFL history this offseason, and he earned it. 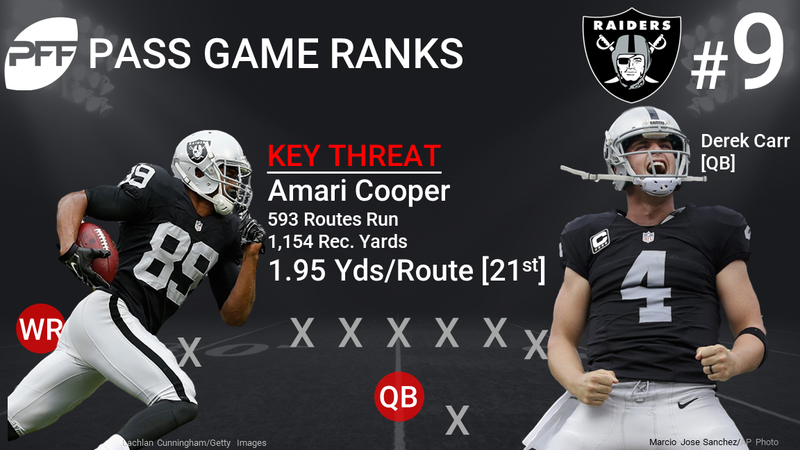 Carr graded as our sixth highest quarterback and his top threat of Amari Cooper finished with a 1.95 yards per route run average, 21st among receivers. Add in veteran Michael Crabtree (fifth highest yards per route run from the slot in 2016 at 2.14) and the new acquisitions of Cordarrelle Patterson and Jared Cook, and there is no reason not to expect big things from Carr and the passing game in Oakland. They need to be mindful of drops as a unit however, as Carr had 37 of his passes dropped in 2016 – highest among any quarterback. WR T.Y. Hilton not only fielded the eighth most targets last season (143), he ran the fifth most routes (615). What set Hilton’s 2016 season apart, is among receivers with 126 or more targets (there were 14 of them), Hilton led them all with his 2.35 yards per route run. QB Andrew Luck finished with the fifth-highest passer rating from a clean pocket (112.0) and WR Donte Moncrief finished as not only the 38th highest graded overall wide receiver, but also with the 38th highest receiving grade among all 115 qualified receivers. The Chargers saw a duo of wide receivers finish with grades in the top 33 as Tyrell Williams ranked 31st and Dontrelle Inman 33rd. QB Philip Rivers threw the sixth most touchdowns on deep passes (10) as the Chargers were one of only two teams to have three or more wide receivers haul in deep-pass touchdowns (Williams , Travis Benjamin  and Inman ). Factor in a new formidable target in rookie WR Mike Williams with the return of Keenan Allen, and Rivers has to be a happy man entering his 14th season. QB Matthew Stafford fielded a mark in the top 10 in both adjusted completion percentage (76.1) and in passer rating when under pressure (78.2) in 2016. WRs Golden Tate (34th) and Marvin Jones (46th) each finished in the top 50 percent among all wide receivers in yards per route run and TE Eric Ebron fielded the 19th highest receiving grade among tight ends. Maybe most impressively, had RB Ameer Abdullah qualified based on snap count before his injury, the duo of Abdullah and Theo Riddick had combined for two of the top four receiving grades among running backs. Still, Riddick finished with the third highest receiving grade out of all RBs. Add in rookie WR Kenny Golladay and pass-catching TE Michael Roberts from Toledo, and Stafford’s threats are growing. 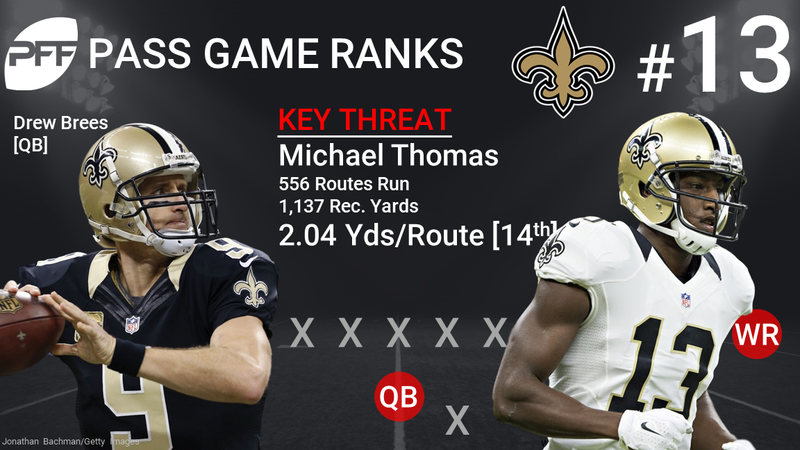 The emergence of Michael Thomas in his rookie season was enough to let Brandin Cooks go, as Thomas averaged 2.04 yards per route he ran, 14th best among WRs, and second among rookies in 2016. Thomas also broke 20 tackles after the catch – one of just four wide outs to record 20 or more over the season – and dropped only four of the 96 catchable targets sent his way in year one. All Brees did in his 16th season was finish with the second highest adjusted completion percentage in the league (79.6) not to mention casually surpassing the 5,000-yard passing barrier again. Highlighting the Bengals at No. 14 is obviously WR A.J. Green, whose 116.3 passer rating when targeted was good enough for 12th best in the league. Brandon LaFell saw the 25th highest at 106.1 and Tyler Boyd hauled in the 12th most yards from the slot. In addition to Green, LaFell and Boyd, RB Giovani Bernard finished with the 15th highest yards per route run among running backs while fielding the 10th highest receiving grade out of the backfield. QB Andy Dalton had success throwing at his onslaught of targets, fielding the 11th highest adjusted completion percentage, and factoring in TE Tyler Eifert with the rookie combination of speedy-John Ross, big-bodied Josh Malone and the all-around talents of RB Joe Mixon, and don’t be surprised if the Bengals don’t rise from No. 14. Second overall pick from last year’s NFL draft, Carson Wentz had a terrific start to his rookie season, fielding the third highest adjusted completion percentage in Weeks 1-4. However, after a Week 5 loss in Detroit, things went downhill and Wentz finished the season with the same rank in adjusted completion percentage as the Eagles find themselves here, 15th. WR Jordan Matthews (97.8) was the only Eagles receiver to see a passer rating above 65.6 when targeted, but the team made a big move with the acquisition of Alshon Jeffery. With the recent release of WR Dorial Green-Beckham, the team’s depth remains spotty, with much riding on Nelson Agholor and the unknowns of the rookie trio of RB Donnel Pumphrey and WRs Mack Hollins and Shelton Gibson as pass-catchers for their sophomore QB. QB Ryan Tannehill finished 2016 with the league’s seventh highest adjusted completion percentage at 77.4, and he did field a top four passer rating on passes from a clean pocket and quick passes. However, Tannehill struggled under pressure and when forced to hold the ball, fielding the league’s 30th passer rating under duress at just 49.1, and the 27th lowest passer rating on passes that took longer than 2.6 seconds to throw (72.0). He’s got the targets in Jarvis Landry, Kenny Stills and DaVante Parker, but consistency across all channels will be paramount for Tannehill and the Dolphins in 2017. Miami was one of only three teams to throw five or more interceptions when targeting two different wide receivers last season. Both Stills and Parker had five INTs thrown in their direction last season. 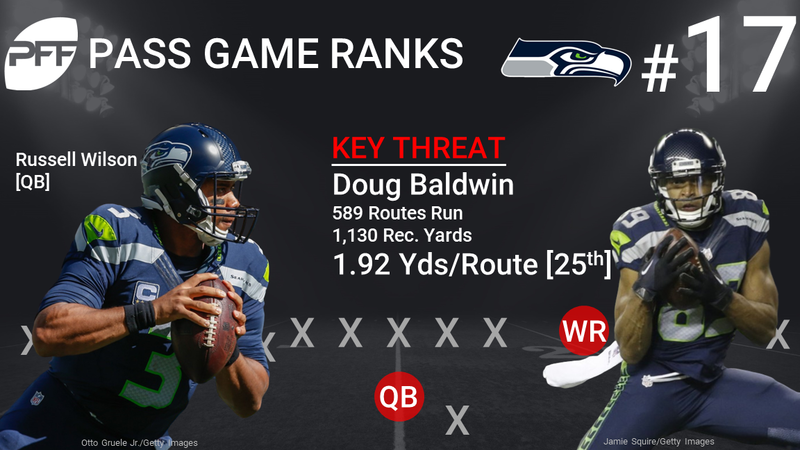 Seahawks QB Russell Wilson found himself near the top of the leaderboard in many PFF QB signature stats in 2016, and his top threat of Doug Baldwin finished last season with a 1.92 yards per route run average, which was good enough for 25th among receivers. Baldwin is a savvy route runner who has shown outstanding ability in the slot or out wide, and is one of the league’s more underrated weapons. The consistency and reliability of TE Jimmy Graham and depth behind Baldwin drop the Seahawks to No. 17 on the list. QB Cam Newton had a big regression in 2016, after his MVP season the year prior. Newton finished with the lowest adjusted completion percentage (65.4) of any quarterback who had at least 147 attempts last year. Did the re-addition of Kelvin Benjamin factor into that? Veteran TE Greg Olsen and the dual-threat capabilities of the rookie duo of Christian McCaffrey and Curtis Samuel should provide a boost to the Panthers passing game, but it all firmly rests on the now-surgically-repaired-shoulder of Newton, and the unknown potential of these newly acquired matchup weapons within the offense. WR Brandon Marshall will suit up for home games at the same stadium that he did last year, just in a different uniform. Marshall joins Giants WR Odell Beckham Jr. as the top two targets for QB Eli Manning, as Beckham finished last season with the seventh highest yard per route run average at 2.27. WR Sterling Shephard was great in the slot last season (most touchdowns when lined up in the slot at eight), but while once Eli Manning was the force carrying this Giants offense, now he might be the thing holding back a talented group of weapons, as his overall PFF grade of 53.0 last season was the lowest he has posted since 2006. Minnesota wasn’t supposed to have Sam Bradford as their quarterback in 2016 as he was acquired via trade just eight days before Week 1 of the season. All Bradford did last year for the Vikings was lead the league in adjusted completion percentage as the only QB to break the 80.0 percent mark. He was aided by an offense that became increasingly high-percentage as the year wore on, but Bradford’s play was impressive at times, and earned him a PFF grade of 82.9, good for twelfth league wide. WRs Adam Thielen and Stefon Diggs were a big factor in Bradford’s success as Thielen ranked sixth (121.9) and Diggs ranked 24th (106.2) in passer rating when targeted. However after departures from Cordarrelle Patterson, Minnesota and Bradford lack viable targets other than Thielen, Diggs and TE Kyle Rudolph. Can rookies Stacy Coley, Rodney Adams and/or Bucky Hodges become reliable targets for Bradford, not to mention second-year player Laquon Treadwell? Third-year Titans QB Marcus Mariota was having a much better season last year than his rookie season, before injury derailed him in Week 16. The Titans did a bunch to add a supporting cast of characters around Mariota, much like the Buccaneers did this offseason around Jameis Winston. 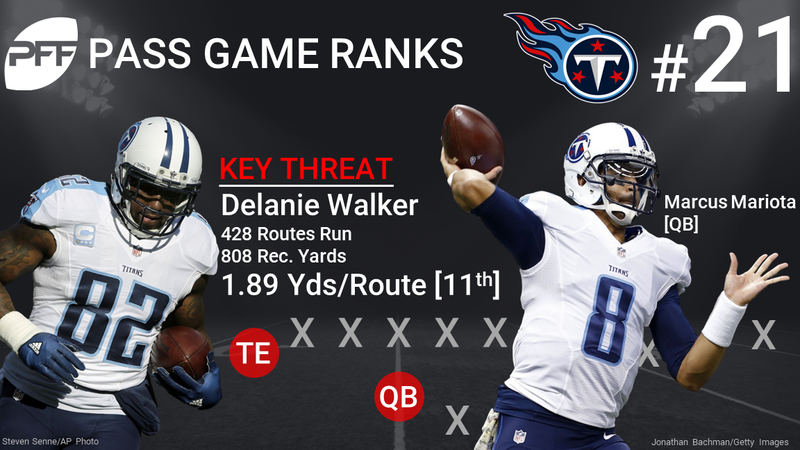 Joining Delanie Walker at tight end will be rookie Jonnu Smith and joining Rishard Matthews at WR will be former Jets WR Eric Decker and rookies Corey Davis and Taywan Taylor. The cast and crew assembled around Mariota seems daunting for any team to cover – and the success of them will almost certainly be derived from the rookies play, the unknown quantity of which is largely what keeps this group so low on the list. If Mariota can continue his progression this group could leap up the list quickly in 2017. The Chiefs, led by QB Alex Smith and his sixth highest adjusted completion percentage (77.8) last season, let WR Jeremy Maclin go during the offseason, leaving themselves with rookie sensation Tyreek Hill and TE Travis Kelce as the only proven, viable options for Smith to throw to. Can Hill, who averaged 2.30 yards per route run last season (fifth highest), keep up his lofty expectations in 2017? Can Chris Conley emerge? Who else can Smith find in the passing game? The questions start to pile up in terms of the Chiefs passing game. Outside of WR Sammy Watkins (22nd highest yards per route run – 1.94) and rookie Zay Jones (who led the FBS in targets and receptions last season), the Buffalo Bills have a variable cast of underwhelming options at wide receiver. Andre Holmes had a decent season in 2014 (1.47 yards per route run, 59th), Corey Brown had the fourth lowest among 96 qualified receivers in yards per route run last season in Carolina, and then Brandon Tate and Rod Streater. Not to mention the main question – how well will QB Tyrod Taylor get the ball to these guys? Mike Glennon or Mitchell Trubisky? Gone is Alshon Jeffery. Back are the oft-injured Kevin White and Cameron Meredith who dropped a pass every 10.81 targets, 25th highest rate among 96 receivers. Jordan Howard was sensational with the ball in his hands as a rookie running back last season, but he dropped eight passes from just 46 targets. Their ranking at No. 24 factors in that all, but really doesn’t it come down to who is throwing the ball in Chicago? Similar to the Bears, who is going to be attempting the passes in Denver in 2017? Paxton Lynch (who has impressed this offseason) or Trevor Siemian (28th of 37 in adjusted completion percentage). Neither player’s play so far has been up to standard, and the most important position for them seems to be a limiting factor on paper. 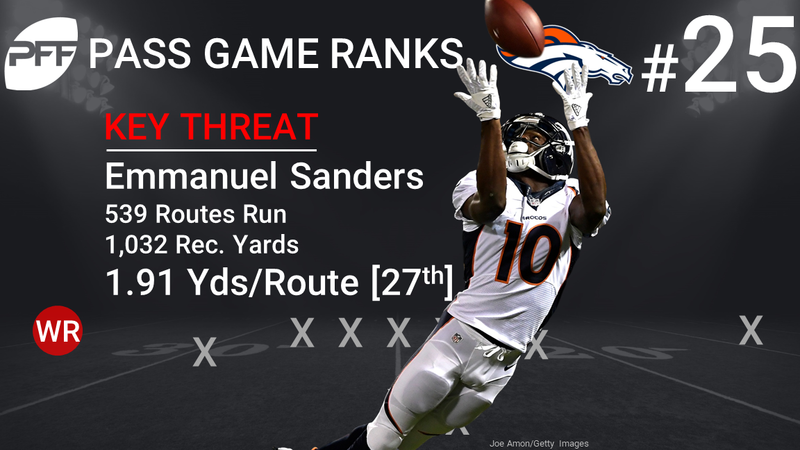 WR Emmanuel Sanders hauled in 1,032 receiving yards and averaged the 27th highest yards per route run in 2016 at 1.91. Demaryius Thomas (7.22 drop rate, 53rd lowest in 2016) and rookie Carlos Henderson round out the top targets for whomever is throwing in Denver, but that’s about it. What to say about QB Joe Flacco and the Ravens offense. The retirements of both Steve Smith and TE Dennis Pitta will hurt, as the top targets left from last season on the Ravens roster are WRs Mike Wallace and Breshad Perriman. Wallace didn’t make much of an impact past Week 2 (ranked 62nd out of 92 receivers in passer rating when targeted from Week 3 on) and Perriman has yet to emerge after being selected in the first round of the 2015 draft. Combine that with the fact that Baltimore addressed only defense and offensive line in the NFL draft back in April, and the recent news of TE Darren Waller’s suspension, and the Ravens may be hurting for targets for Flacco this season. It remains to be seen how much of an impact newly signed WR Jeremy Maclin will be out of the slot. The Jaguars are confident in QB Blake Bortles heading into 2017, but numbers are not. Bortles ranked 27 th out of 37 in adjusted completion percentage and he had the second-most passes dropped in 2016 – 32. His overall PFF grade of 52.9 ranked 28th in the league, and the Jaguars need a huge reversal in his fortunes for this passing attack to rebound again. Sure, the Allens return in both Allen Robinson and Allen Hurns, but with 15 drops between the two of them in 2016 – they also need to bounce back to the form they showed in 2015. Another question at QB, another low ranking. Tom Savage may have his hands on the starting job at the moment, but it is just a matter of time before the job goes to rookie Deshaun Watson, which brings with it its own set of question marks. Can QB-turned-WR-Braxton Miller really become a viable target in the slot? Will the team be able to find a reliable secondary threat to top wide out DeAndre Hopkins? 2017 remains a mystery for the Texans passing game. In limited action last season, but still enough to qualify among quarterbacks, QB Cody Kessler finished with a 78.2 adjusted completion percentage – fifth highest. However, among those qualified quarterbacks, he had thrown the fourth-fewest passes. Kessler has shown potential, but will be fighting off rookie DeShone Kizer every step of the way and needs to increase his volume of big plays. 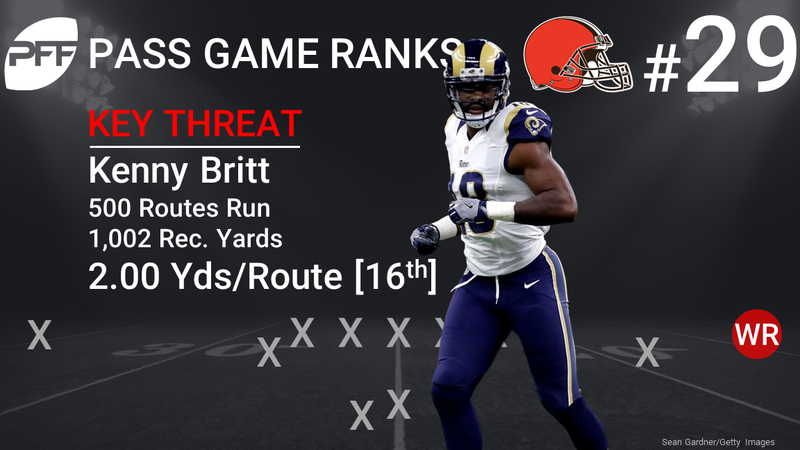 WR Kenny Britt may become a welcome addition as he saw averaged 2.00 yards per route run, 16th highest last season. After that, it’s unproven Corey Coleman and rookie tight end David Njoku rounding out the top threats in Cleveland. While reuniting QB Brian Hoyer with his former offensive coordinator in Cleveland, Kyle Shanahan, may seemingly be a good idea, Hoyer actually fielded the league’s worst adjusted completion percentage in the year with Shanahan at OC in Cleveland. Outside of that, more questions arise. They brought in Pierre Garcon (22nd highest passer rating when targeted) from Washington and Marquise Goodwin (just a 46.6 passer rating when targeted – 97-out-of-98) from Buffalo, but after that there is little to no depth. 2016 No. 1 overall selection Jared Goff struggled in his rookie season, as did the Rams passing game. Goff ranked 35th out of 37 in adjusted completion percentage and had a 72.9 passer rating on passes when kept clean from pressure, the lowest of all qualifying quarterbacks. Tavon Austin (ninth lowest passer rating when targeted last year), Robert Woods (three drops on 49 catchable targets) and two rookies will man the top target spots for Goff as they’ll have to lean on early impacts from Eastern Washington’s Cooper Kupp at WR and South Alabama’s Gerald Everett at tight end. The New York Jets find themselves at the bottom of the pass game ranks as virtual cast of unknowns will take center stage in 2017. A three-way battle at QB between newly acquired Josh McCown (second lowest adjusted completion rate in 2016), Christian Hackenberg and Bryce Petty doesn’t give much promise to Jets fans, while Quincy Enunwa (led the league in drops and had the fourth highest drop rate in the NFL), a couple of second-year players in Charone Peake and Robby Anderson (will he play, or will he still battle legal trouble?) and a couple of rookies round out the targets in New York after WRs Brandon Marshall and Eric Decker have left this offseason.